Your Heating and Air Conditioning Experts! In 1993, Jack and Karen Watters decided to start a family business, Reliable Heating & Air Conditioning. Reliable is Winnipeg’s most trusted source for heating and air conditioning. With over 25 years experience, we stand by our reputation for excellent customer service and competitive pricing. 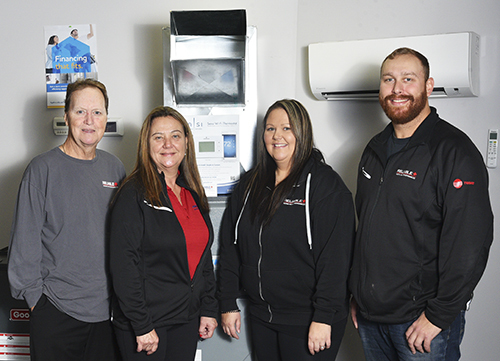 At Reliable Heating and Air Conditioning we have one primary goal: The complete satisfaction of our Manitoba customers. If your heating and air conditioning isn’t working the way it was last year (or even last month), it’s time to get comfortable with Winnipeg’s air conditioning and furnace repair experts. We are standing by 24/7 to meet your repair or maintenance needs. Call us 24/7 204-888-6663, or send us a message online. Reliable can help you install, replace, or service your furnace or boiler. Reliable can help you with your conventional hot water tank, or on-demand tankless water heater. Fill out our online form to book a service, or call us. Reliable provides air conditioning maintenance and repair to commercial and residential clients. Click here to find our address, phone number, or to send us an email. In 1993, Jack and Karen Watters decided to start a family business, Reliable Heating & Air Conditioning. With 4 children and their busy lifestyle, they knew it would be challenging. However with dedication to their work and loyal customers, the company began to grow rapidly. With this growth, Reliable hired Rob Johnson as a salesman. Rob has always been hardworking and committed to Reliable which led to him to be a part owner. The Watters’ children, Kelsy and Clint are being mentored to bring on the tradition of our 25 years of business and will be carrying Reliable well into the future. Reliable Heating & Air Conditioning LTD. is your source for heating, air conditioning, HVAC, HRV, hot water tanks, and more!